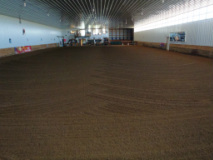 Ridequine is a fifty horse boarding and training facility. Diets are monitored and individualized using a combination of high quality hay, pellets, cubes, oats and some supplements. Additional supplements supplied by owners are welcome and will be administered as requested. Horses are checked daily and we have a ferrier available every 3 weeks. It's a great facility for the active or retired horse. We also board small pets in our kennel! Open 7:00 a.m. to 10:30 p.m.
Boarding fees are due on the 1st of the month.Owners provide their horses with salt/mineral supplements, dewormers, vaccinations and farrier service. Ridequine follows a deworming/vaccination schedule and can administer these to client horses, with the owners paying for the supplies. A farrier is scheduled every three weeks and horses are seen at the owner's request. All fees are payable to Ridequine and are due in advance, or on the day of, service.